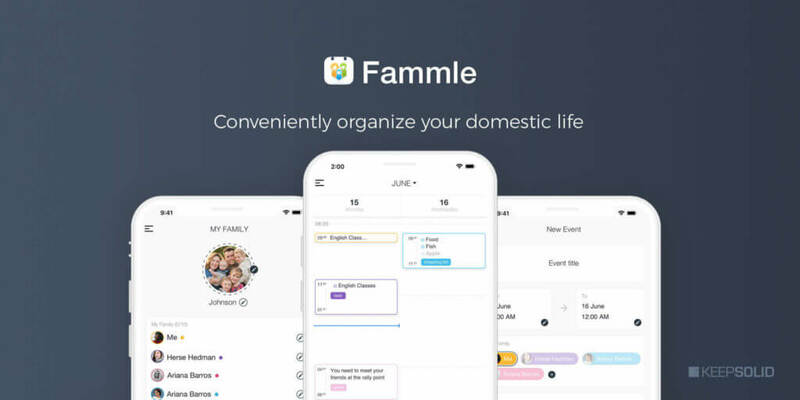 Fammle is a free family organizer developed by KeepSolid to schedule household events and tasks. It allows users to create their own or review other family members’ plans in a calendar, assign personal or collective tasks, track birthdays, draft and review shopping lists. With Fammle, users can stay on track with all classes their children have, all dinners they have to not miss out, remember all the family birthdays and much more. Currently, Fammle is available only for iOS devices. Users are able to fill their family calendar with personal and collective events, invite others, and schedule all kinds of activities. The calendar automatically synchronizes between your family members, which allows everyone to keep track of each others’ plans. Plenty of convenient features in the app and clear, colorful visualization facilitate this process. Fammle gives users an opportunity to create and manage shopping lists, set reminders, and use other helpful app’s functionality to make sure your groceries or other purchases are done and are exactly what you needed. The app allows you to tick out the items you’ve bought to avoid doubles. It ensures you won’t lack an important ingredient or have unnecessary extra because of some mix-up. Assign personal or collective tasks to family members and easily track their completion. It’s a useful feature for everyday planning and collaboration that will help you to keep everyone on one page. You will always know how your family’s faring, whether Lil’ Danny visited his dentist, or if someone needs your experienced advice or support. If one day you decide to delete your Facebook account, you might face some troubles with keeping in mind all the birthdays of all your friends and relatives. Fammle developers took care of this too. Simply input your relatives and friends birthdays dates or import them from Apple Calendar, set reminders and never again forget about any birthday. You can even make some notes about present ideas for the future. Besides free mode, the app has in-app purchases that remove ads and provide access to such extra features as shopping mode. One-month subscription for a family (up to 10 users) costs $1.99 and 1-year subscription for a family costs $14.99.